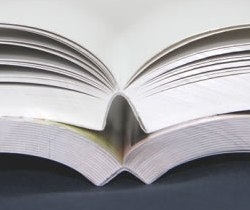 Book Printing Lingo: What is PUR Binding? 1) PUR has superior flexibility, which prevents the spine from cracking when the book is opened wide or pressed down flat. 2) Compared to EVA adhesive, PUR offers 40% to 60% better resistance to page pull-out. In fact, it is nearly impossible to pull a page out of a book bound with PUR adhesive. 3) PUR can adhere to a wide variety of substrates, including ink, varnish, recycled paper, mylar, and UV-coated or aqueous-coated stock. 4) PUR’s performance and structural integrity is unaffected by extreme cold or hot environments (-40º to 200º Fahrenheit). 5) Because PUR is so strong and pliable, less adhesive is needed to firmly bind the cover and pages. Less glue means less distortion of the spine’s shape, resulting in a crisp, square appearance…even on thinner books. Bottom Line: If quality and durability are important to you, always select PUR binding when you have the choice. If you have any questions about PUR Binding, or have an upcoming PUR book project, give Formax Printing Solutions a call at (314) 434-5500 or (866) 367-6221. Softcover book printing is one of our specialties, so we look forward to assisting you!